Daily Illuminator: Visit Majestic Caverntown! May 2, 2018: Visit Majestic Caverntown! When you're a dungeon-delving adventurer, sometimes you just need a place to hang your hat (or wizard cap, great helm . . .). If you're looking for somewhere to call home – or at least an interesting destination on your way to danger – you need to visit Caverntown. 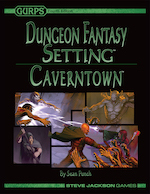 From the mind of GURPS Dungeon Fantasy architect Sean Punch comes GURPS Dungeon Fantasy Setting: Caverntown. This meaty supplement describes a breathtaking underground city that's right next door to adventure. It provides a description of its history, details of its movers and shakers (including GURPS stats for some of the most interesting ones), and info on how to set up in Caverntown as a permanent home. It also includes expanded rules of interest to urban-minded heroes, plus rumors and adventure opportunities stemming from Caverntown. Make your dungeon-fantasy gaming more fantastic with a city unlike any you've ever seen, with Caverntown. Your guidebook is just a download away, thanks to Warehouse 23!